In 1961, four young public school friends put together the first issue of Private Eye with typescript (created on a couple of old Selectrics), Letra-set, and cow-gum– the pre-Punk template for the Eye ever since. It was the sprouting of a thorn that has lodged firmly in the side of the British Establishment ever since… the birth of a British institution. This new magazine chimed with the so-called satire boom, in which Peter Cook, Dudley Moore, Alan Bennett and Jonathan Miller conquered the world with Beyond the Fringe, and producer Ned Sherrin made a star of David Frost (who Booker later described as a man with “..a peculiar ambition to be world-famous simply for the sake of being world-famous”) on the highly successful That Was The Week That Was—which proved so successful it was canceled after 2 series. 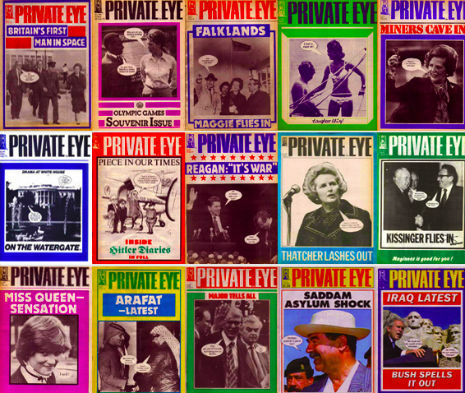 The Eye continued long after both these shows and the satire boom had run out of laughs, in part much aided by the backing of Peter Cook, who helped finance the magazine until his death in 1995. As we express our gratitude for Stewart and Colbert, we might recall that it was on this date in 1982 that full-fledged member of the Hollywood nobility (daughter of Henry, two-time Oscar-winning actress, model, and anti-war activist) Jane Fonda released her first exercise tape. Building on the success of her workout book, published the prior year, the tape helped Fonda popularize workouts for women, workouts in groups, workout videos, and indeed aerobics in general (a family of trends on which Richard Simmons, Judi “Jazzercise” Missett and many others rode). Fonda invested the proceeds of what became a fitness empire into the Campaign for Economic Democracy, an advocacy group founded by her then-husband Tom Hayden (of Chicago Eight renown). Fonda and Hayden divorced in 1989, and Fonda retired from the spotlight (if not, given her entanglement with Ted Turner, the gossip rags)… though, of course, she has returned to the movie screen in recent years.